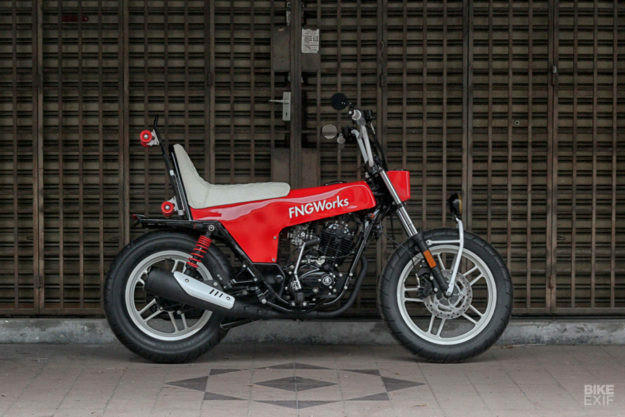 When the Malaysian outfit FNG Works landed an entry in a local custom bike build-off, lead builder Irwann Cheng had a decision to make. Would he play it safe, or would he throw common sense to the wind, and go all-out? Looking at this bizarre little machine, it’s clear which way he went. 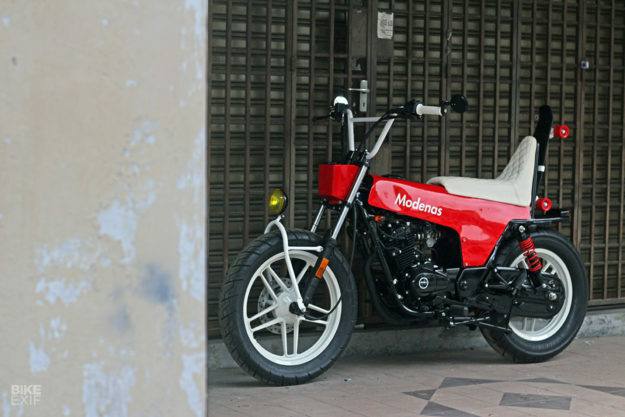 The competition was the ‘Superb Mod Challenge,’ organized by Modenas and MotoNation. 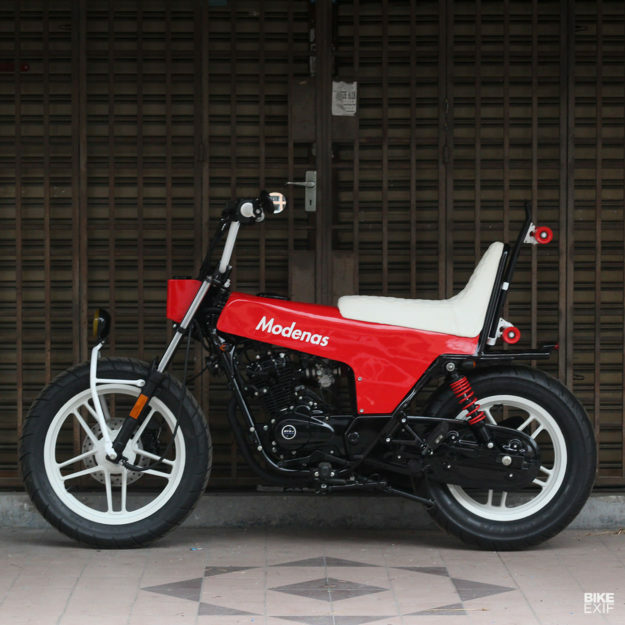 Never heard of Modenas? 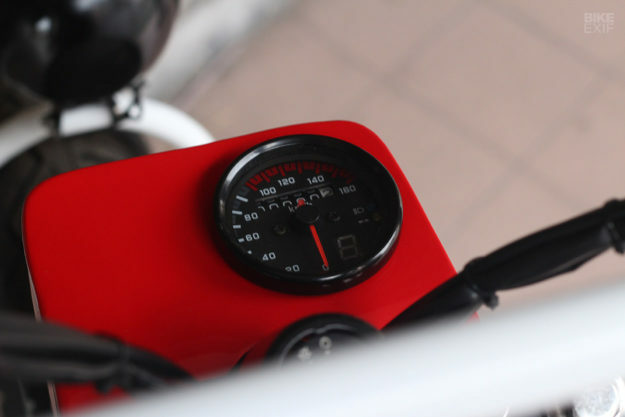 It’s a Malaysian bike brand, and they supplied their V15 model as a donor. The V15 is essentially a re-badged Bajaj V15—a 149 cc single-cylinder commuter bike imbued with (a tiny bit of) classic style. FNG Works got the nod—but the comp wasn’t without pressure. Contestants weren’t allowed to cut the bike’s frame, and the finished product had to be street legal. Each team was given RM10,000 ($2,450) to work with. Irwann had just 26 days to deliver, and if he missed the deadline, he’d have to refund the money. With the bike in the FNG workshop, stripped down to the frame, Irwann’s brain started ticking over. 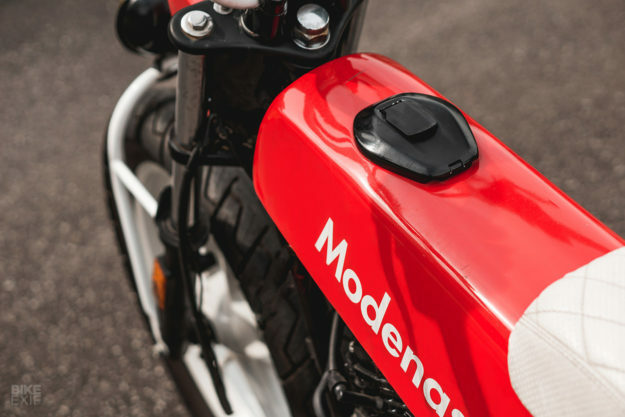 Then he found out that his opponents were doing a café racer and a scrambler—and notions of playing it safe went out the window. 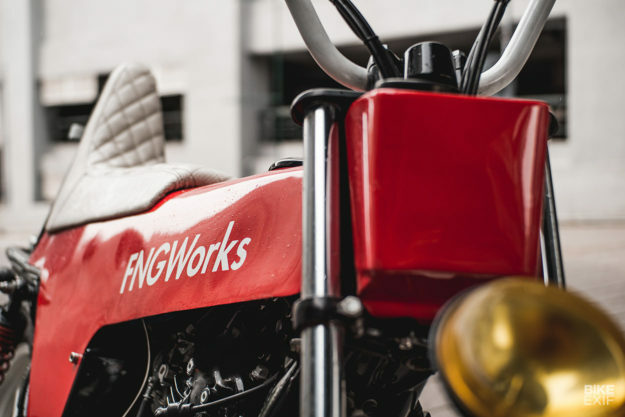 “I have this image of a bike that I’ve always wanted to build, but never did,” says Irwann, “because no clients have given me the freedom to do 100 percent what I want. 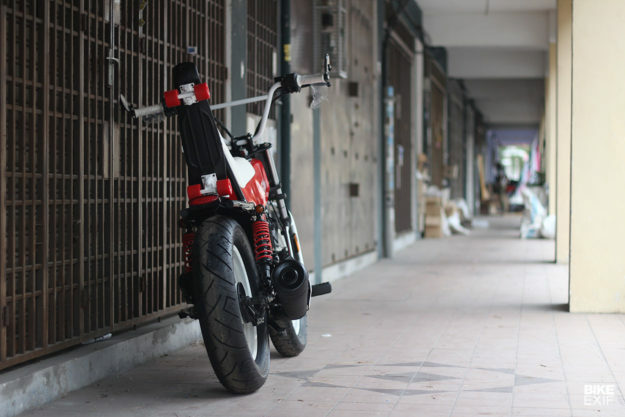 Irwann describes his Modenas as a mix of a Honda Dax, BMX and chopper bicycle, with a bit of ‘urban lifestyle’ and Japanese bōsōzoku style chucked in. With some digital sketching—in basic MS Paint, not Photoshop or CAD—Irwann tweaked his vision to match the frame of the V15. He knew he couldn’t cut the frame, but no-one said he couldn’t weld on it. 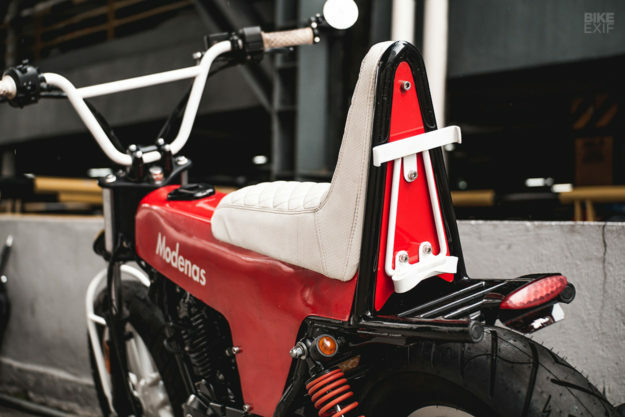 So he added some rods across the back—creating a luggage rack and visually shortening the bike. The rear end’s finished off with a taillight that doubles up as a stopper for the luggage rack. And since the rules included concessions for cleaning up the frame, Irwann lopped off a few unsightly brackets too. For the bodywork, Irwann wanted to build a new monocoque structure from scratch, even though he’d never built a fuel tank of this size. The learning curve was steep—and there was a real fear that the project would run over deadline—but he pulled it off. The design combines a small fuel tank with a seat pan and side covers, and uses the stock fuel cap and petcock. 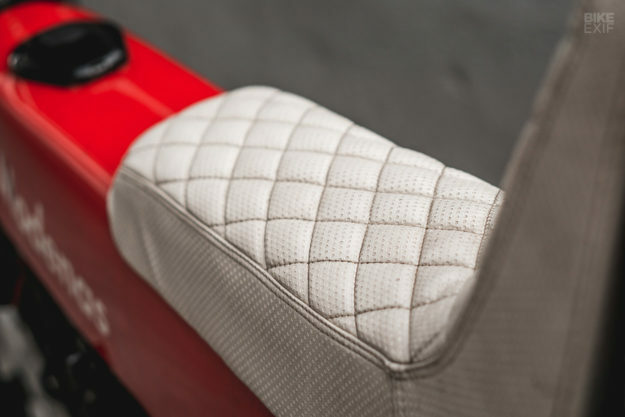 The seat’s a clear hat tip to the fascinating bōsōzoku scene, and to vintage chopper bicycles. 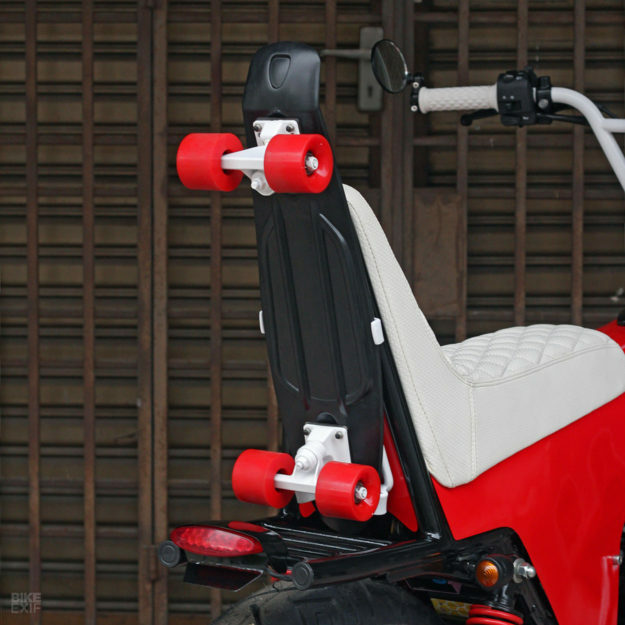 But our favorite feature’s hiding behind the sissy bar: a neat mounting rack for a Penny board. 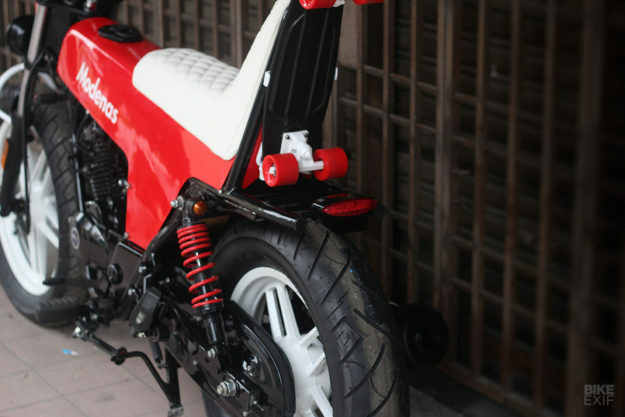 Irwann repainted the stock 18F/16R wheels to match the bike’s fresh new color scheme, and fitted chunkier rubber. Moving to the front, Irwann built a headlight mount in the style of the front pannier racks you find on touring bicycles. 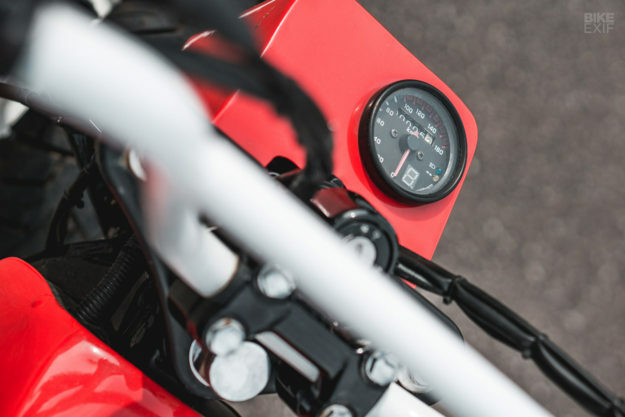 The handlebars are Peregrine BMX numbers, fitted with Biltwell Inc. grips and bar-end mirrors, and a small fairing up top holds the speedo. He did repaint the motor black, and switch the bolts out for chromed stainless steel items. The exhaust was painted black too, and the heat shield white. 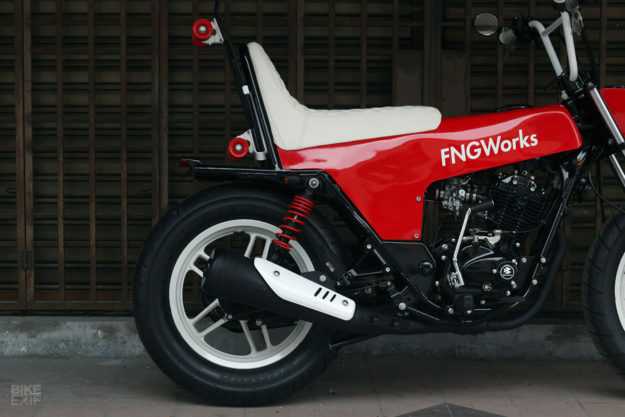 As for that striking red paint—and the FNG Works logo—Irwann’s open about their origins. “For the color scheme, I was inspired by the Supreme brand,” he confesses. We’re not entirely sure we’re in the target market, but we love it. It’s cheeky, fresh and looks like buckets of fun. The ‘Superb Mod Challenge’ head judge was Neil Blaber of AMD World Championship fame, and clearly agreed. FNG Works not only made the deadline, but walked away with top honors, too.